Now, I do not know Ms. Aquino, so I will give her the benefit of the doubt regarding her sincerity. As my pastor likes to say however, you can be sincere and sincerely wrong. So often the defense from people who stand by those who are false is that they have a good heart or that I do not know their heart. The good news is I do know their heart. The Bible assures me it is as wickedly deceitful as my own and therefore I need to rely upon the surety and verity of Scripture to counteract the lies of the human heart. The first element we see in the anatomy of a false prophecy is some form of mysticism associated with it. 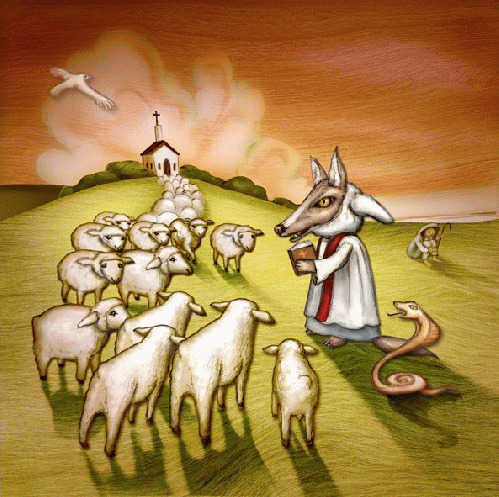 The more brazen false prophets will simply say God told them but most will take this route. There is a dream or dream like state that God speaks to them in. It lends an aura of spirituality to the prophecy to prop up what will usually be unbiblical. Some will flat out say they had a dream that they then in turn interpret. Others will claim a waking visitation, where Jesus comes to them in a trance like state and shows them things. Kim Walker-Smith of the heretical Jesus Culture claims such a visitation where Jesus whisked her away to the throne room of God where she saw the Father face to face. This is a perfect example of contrasting the wicked deceit of the human heart and the assuredness of Scripture. The Bible tells us that none may see the Father and live yet Kim tells us that she experienced the opposite. Since we trust the infallibility of Scripture, we must dismiss Kim Walker-Smith's visitation as either a willful lie or a demonic visitation. This is simply not found in the Bible beloved. There are not degrees of the lost. Some of the unsaved are not merely downtrodden, lying in a field, waiting for someone to help them up. They are in rebellion to God and think the things of the Lord are utter foolishness. There is only one method to reach them and it is called the Gospel. There are not new methods discussed in Scripture. This is straight up demonic NAR, purpose driven theology. Rick Warren teaches that pastors must reach the lost where they are at. To find relevance to their lives. The problem is the Bible says the opposite. They need to hear the Gospel to realize that Jesus Christ overcame this life and this world and that through His finished work on the cross they might as well. We do not need more human wisdom and gimmicks to try and reach the lost with the same level of carnality that is sending them straight to hell already. We have seen these gimmicks when worship incorporated ACDC, Miley Cyrus, and the Backstreet Boys. We have seen the church transformed into a motocross track, a monster truck rally and a circus. We have heard sermonettes on Jesus as our wing man, how God is never angry with us, and a complete rewriting of the Ten Commandments to make them more palatable to sinners. All of these schemes combined to rescue not one crushed stalk of wheat off of the threshing floor. The Bible teaches us that no one gets saved without the Gospel. No one. Pay no mind to fanciful dreams and pious sounding cliche's. We do not need the Anna Aquino's of the world to tell us what God might be saying, kinda, sorta. We have thus sayeth the Lord. We just need to open it and read it. We are as the key verse says, men of sincerity, commissioned by God, in whose sight we speak in Christ. Not like so many peddlers of God's Word. Amen.